Ever since I brought down our box of holiday decorations, the kids have been obsessed with the strands of lights. We had so much fun making our own Star Lite-Brite yesterday - you know you want to make one too! First, spray paint the outside of your box and let dry. On the inside of your box draw the outline of a star. Add dots along the outline (where you anticipate the lights to go) as a guide for where to punch. Be careful not to place the punches too close as it will make it difficult to string the lights through later. Using a pen, punch holes along the outline. I demonstrated how to do this once, and then my daughter insisted that she needed to punch out the rest on her own. This was the longest part of the entire process (not necessarily because it was difficult - but because each time she punched a hole she would want to count how many she had left). She was so pleased with her work. Finally, push the lights through your punched holes. Turn the main lights off, turn your lite brite on, and enjoy the glow. This activity turned out better than I imagined it would. It was simple and quick, and my daughter created pretty much the entire project with minimal instructions from me. The tasks were repetitive which gave her ample time to master them. The hardest part was letting my daughter do all the work - it looked so fun - maybe we'll have to make another one for me! You are awesome. OMG. I really love this! Very clever! We've been playing with LED Christmas lights this week, too! Your daughter must be so enchanted with her light bright star. Love it!! 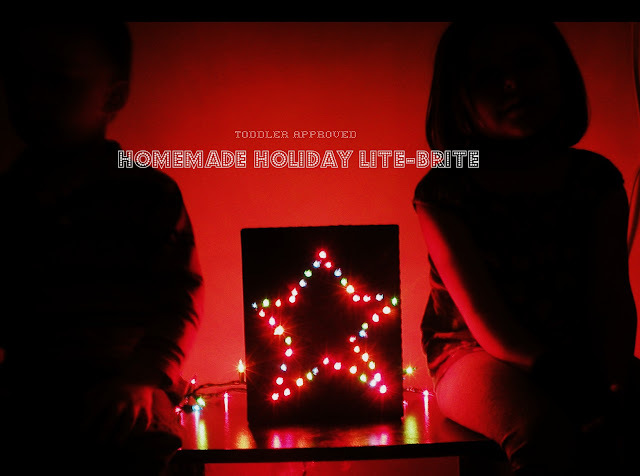 Lite Bright was one of my favorite toys as a kid, so this will be a great alternative for my son! Fantastic!